On Monday afternoon, the New York Yankees completed a deal to acquire now notorious left hander Aroldis Chapman from the Cincinnati Reds. In return the Reds will be receiving a group of four minor league prospects, none of which are from the Yankees big four of Gary Sanchez, Aaron Judge, Jorge Mateo, or Greg Bird. The four names include, RHPs Caleb Cotham and Rookie Davis and INFs Eric Jagielo and Tony Renda. 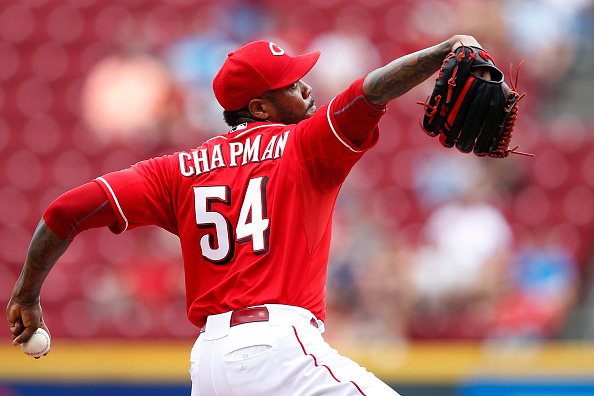 Despite the domestic violence allegations, and the falling through of the trade with the Los Angeles Dodgers, the Reds were still able to trade Chapman, albeit for a much less significant package. In response to the trade, here are three takeaways on what Chapman being in New York means for not only the Yankees, but the AL East and all of baseball. The first, and arguably biggest, takeaway from this trade is the matter that Aroldis Chapman could still very well be suspended sooner rather than later. The Yankees are taking quite a significant risk here, as they could be without Chapman for a significant portion of this next season if he is suspended. Beyond that, Chapman is also on the final year of his contract, making his situation even more tenuous. However, if any team can afford to sign Chapman long-term, it would be the Yankees, although it remains to be seen if that is in the cards. At this point, the Yankees are acquiring a player who may or may not be able to play the entire season for them next season. Either way, they have acquired one of the top five bullpen arms in all of baseball. With Chapman now on the roster, the next logical step for Brian Cashman and the Yankees may be to attempt to trade Andrew Miller once again. Although the Yankees bullpen is quite formidable as is, having two lefties may be redundant, and the Yankees may wish to trade the more desirable Miller in order to acquire more pitching depth, or perhaps more depth at another position. Miller obviously has more value than Chapman does at this point, given the domestic violence allegations, making him a good trade candidate now that Chapman is in town. However, the Yankees may choose to just keep all three together, forming one of the deadliest bullpens in baseball history. Greatest Bullpen in Baseball History? While the possibility of trading Miller is still there, the Yankees could choose to instead keep all three of Miller, Chapman and Dellin Betances, and form what could very well be the greatest bullpen in baseball history. Since the Yankees sat back and watched while the Red Sox acquired Craig Kimbrel and Carson Smith, forming a quite formidable bullpen of their own, the Yankees now be attempting to top that. With those three, the Yankees have done just that. Arguably, at least on paper, the Yankees current trio may be the greatest bullpen in baseball history, by any standard, but at least in terms of ability to collect strikeouts. It remains to be seen if that will come to fruition, but the Yankees may have just created the greatest bullpen in baseball history.